Made from premium scallop, Knorr Concentrated Scallop Boullion offers a consistent stock solution for chefs to overcome factors like high ingredient cost, seasonal fluctuations and handling challenges. It helps to enhance the top note aroma of premium stock and dishes while offering a well-rounded taste and clear, glossy colour. Salt, Monosodium Glutamate, Permitted Flavourings (Contains Crustaceans, Molluscs, Fish, Cereals containing Gluten), Sugar, Modified Starch, Palm Fat, Hydrolysed Vegetable Protein, Scallop, Sodium Inosinate & Guanylate, Edible Gum, Citric Acid and Colouring. 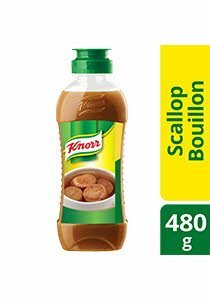 For Stock: Dissolve 40g of Knorr Concentrated Scallop Bouillon in 1L of boiling water. Recommended to place in fridge after opening, and use up the products as quickly as possible. Shake well before using.